Mikhail Voskresensky commands an international reputation as a pianist in the great Romantic tradition. He is prizewinner of four international piano competitions (Schumann in Berlin, in Rio de Janeiro, George Enescu in Bucharest, and Van Cliburn in Fort Worth, Texas). In 1966 he was honoured with the Merited Artist of Russia award and in 1989, the People’s Artist of Russia. Mikhail Voskresensky has extensive concert experience. He is the only pianist in Russia to perform all of Chopin’s piano compositions during one concert season; this in 1982 / 83, in nine recitals in the Maly Hall of the Moscow Conservatoire. In 1957 the young pianist took part in the Prague Spring Festival where he performed European premiere of Shostakovich Second Piano concerto with the presence of Shostakovich himself. Mikhail Voskresensky is a distinguished professor at the Moscow Conservatory, the chair of the professorship of piano faculty. His pupils have won 126 international prizes including 55 gold medals. 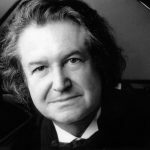 Mikhail Voskresensky is President of the Scriabin International Society and Guest Professor in the Toho Gakuen School in Tokyo.Although Mr. Voskresensky devotes many of his efforts to teaching and giving master classes in various countries, he undoubtedly considers his primary purpose to be performing. Voskresensky is an extraordinary and unique musician: when hearing his playing one can feel his sincere and subtle soul – a rare thing, indeed, in our rational times. He recorded more than 50 CD’s, including a box with all Mozart Piano Concertos (2013) and a 5CD box (2015) with all Mozart Piano Sonatas.